I don’t know about you but one of my favorite holidays is Halloween. Halloween is that one day of the year where pretty much anything goes. Exaggeration, taboos, political correctness is all ignored in the name of having fun. I’m assuming that if you have chosen October 31st as your wedding day, you are an out there bride and I’m already in love with you! For this bride it is all about the drama of the event. She wants to have fun and wants her guests to enjoy themselves by creating a light atmosphere. No, it’s not an oxymoron. You can create a light atmosphere in a somber setting due to the nature of the holiday. The inspiration for this wedding is the Tim Burton’s animated movie, The Corpse Bride. It is a beautiful story about true love, kindness, and selflessness. Victor’s (main character) wedding vows are absolutely lovely. Any bride would want her groom to recite those to her. I can also see a bride walking down the aisle to Victor’s piano solo. It sounds a bit like Beethoven’s Moonlight Sonata, so you know it will melt everybody’s hearts. I envision this wedding in an old mansion with dark wood paneling and glorious wood staircases and chandeliers. 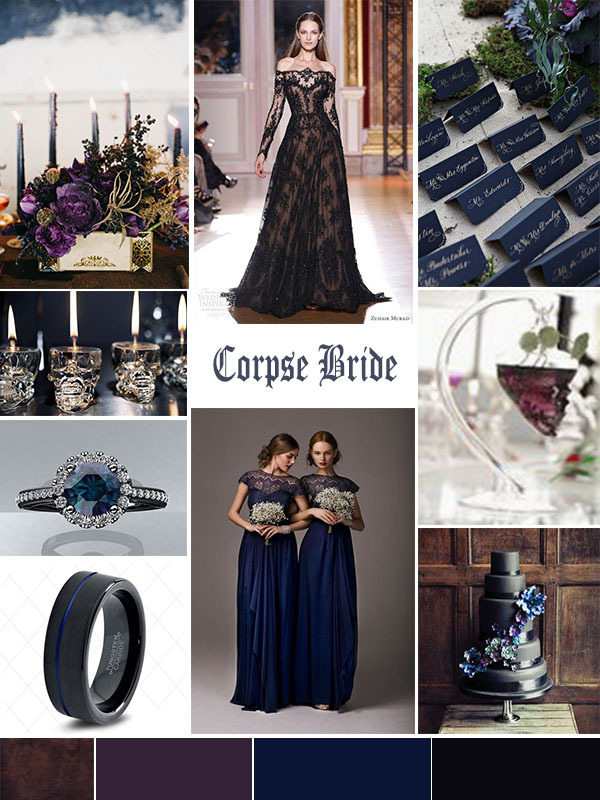 This wedding also works well for a Gothic bride with very traditional parents as she can give her parents the conservative wedding they are looking for, while incorporating her style in a tasteful way. What a super fun wedding! Don’t let your wedding planning details waste away and die.